Here’s a true story. It happened to me today, and I think it’s worth sharing. I have a nice ocean kayak, but I don’t use it as often as I’d like. It’s great exercise, though, and catching waves with it is always fun, even if I get dumped (turned over) every once in a while. Usually, I’ll catch small waves near to shore, where Moanalua Bay is quite shallow. It’s fun, with very little risk. I wear reef shoes, so I can hop back on without tearing up my feet if I get dumped. I took the kayak out this morning, paddled out of the Hawaii Kai Marina area (about a half-mile voyage), went under the Kalanianiole Highway bridge, and followed the buoyed channel to the deep waters of Moanalua Bay. I wanted to go beyond the reef and explore the area around Portlock and Koko Head, something I’ve never done before, though I’ve been out there in my Boston Whaler. For those who don’t know, Koko Head is an extinct volcanic crater. Its walls facing the sea are sheer cliffs falling into the ocean, with no area where you could land a boat. Koko Head’s caldera is open on the ocean side, forming Hana’uma Beach Park, and the shore beyond Hana’uma Bay is shear cliffs until you get to Sandy Beach, about five miles away. The ocean seaward of Hana’uma Bay can be treacherous. The waves tend to beat obliquely against the cliffs and bounce off to form a cross-chop that is very difficult to navigate. I had no intention of braving those waters. Once, in a Boston Whaler, was enough. When I emerged from the channel, I headed left toward Portlock. As I did, I encountered high rollers, at least six feet in height. I was still quite a ways from my intended destination but I thought the seas were too rough and decided to head back. But I wanted to get some pictures and video with my Go-pro camera before I left. I took the pictures and then turned to return to Hawaii Kai. I had to turn broadside to the waves to turn back, though, and while I was broadside a breaker hit me, turning the kayak upside down and tossing me out. No problem, I thought. I’ll just get back in like I’ve done a hundred times before. Unfortunately, with my reef boots on and nothing to push against, I tried five times and couldn’t get on. 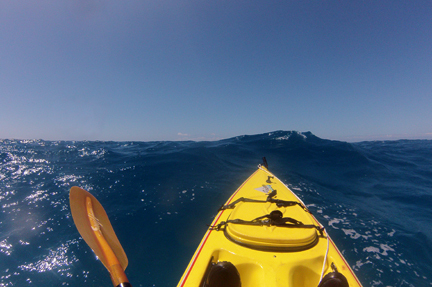 Finally, I took off the reef boots, tried again, and flopped onto the kayak. I lay there, on my stomach, exhausted, for a minute and then flipped to a sitting position so I could paddle. A huge wave dumped me over again within two minutes. After getting on again, I noticed that the current had taken me further around Koko Head, into the rough seas. After being dumped three or four more times, I decided that the only way I was going to get out of that area was by paddling while lying on my stomach. By lowering my center of gravity, I figured I would be more stable. I tried that for about ten minutes, with no visible progress. I also tried swimming, pulling the kayak behind me, to no avail. I decided that I had no choice but to sit up on the kayak and paddle, but I also found that if I dangled my legs over the side, my center of gravity was lowered, and the kayak was more stable. Using this technique, I could stay up and paddle without being overturned. I tried this for ten minutes while monitoring my progress relative to the shore. I made absolutely no progress. I also tried going perpendicular to Koko Head, thinking that I could escape the current that was clearly flowing against me if I got further from the cliffs. The problem with that, of course, was that when I did that, I was heading further out to sea. Right about that time, some large fish bumped into my dangling left leg. I never saw the fish clearly, so I can’t tell you whether it was a shark, but I can tell you that it was large enough to darken the water over several feet and to give me a good thump on the foot. So I had a choice. I could leave my feet in the water and risk one of them being bitten off, or I could bring my feet onboard and risk being tossed overboard, into the ocean, where whatever was out there could do real damage. I chose to leave my feet in the water, but I brought them up, gripping the kayak’s bottom, to make them a less inviting target. I started to make progress, but I was also heading toward green, shallow water. I knew the waves would get higher as the water became shallower. That’s exactly what happened. A large breaker turned me upside down again. By the time I was back in the boat and paddling, I had lost all the distance I’d gained. I carry an I-phone in a waterproof case. I thought it was time to call for help. but in the glare of the sun, I could not see the numbers to enter my access code, and I wasn’t sure I could hear anyone on the other end, even if I connected. I fumbled with it, trying to guess where the numbers might be on the screen and eventually gave up. In the meantime, the current had carried me another quarter mile down the coast. It was time to sacrifice the I-phone. I took it out of its waterproof case, and while being tossed by cross chop waves that were 10-12 feet high, I called 911. The person who answered had a very hard time understanding what I was telling him. He seemed more concerned about spelling my name correctly than taking down important information, and I don’t think he quite put together that I was in a kayak holding a water-intolerant I-phone in very heavy seas. In the meantime, I was drifting, since I couldn’t paddle and hold the phone at the same time. I couldn’t use the paddle to stabilize myself either, and I knew that if I turned turtle in those waters, that would be the end of it. So it was a very nerve-wracking call. By the time he had enough information to pass it on to the fire department, I was opposite Hana’uma Bay. “I’m going to make a try for Hana’uma,” I told him before hanging up and putting the I-phone back in its waterproof case. I paddled another half-hour before my forearms began to cramp, making it hard to hold the paddle. What next, I thought. But I made small progress. I kept paddling, shaking my forearms every five or six strokes to alleviate the cramping. I was just entering the mouth of the bay when the lifeguards came out with their jet skis. These wonderful people hauled me in on a sled attached to the back of their ski. They hauled my kayak back the same way, helped me dump about fifty gallons of water from the hull, loaded the kayak on their truck, and brought me and my kayak back home. I’ll have a libation tonight, and I’ll be sure to toast the wonderful people who helped me out after I did something stupid. The lifeguards couldn’t have done better, and the man on 911, in his own way, may well have saved my life. I’ll give a toast to Steve Jobs, too, for the I-phone.